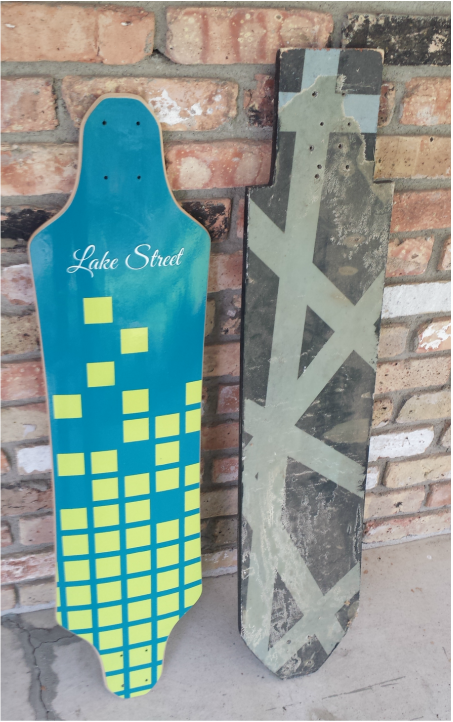 I'm really not sure what compelled me to build my first longboard. I have a different explanation every time I try to describe my initial motivation, but in reality I was the last person who you would expect to try it. I had never ridden one or even seen one around, which wasn't surprising for January in a small Minnesota town. I hadn't had too much hands-on experience with woodworking either, and our house had hardly any tools. 16 year old me had not yet learned to make up for inexperience with patience, so after 5 minutes of research and 20 minutes of shopping I returned home with a panel of subflooring and a bottle of wood glue. I broke the panel in half and laminated two layers together by driving my car over it. After a messy and dangerous coat of fiberglass and a few layers of paint, I had created the abomination pictured on the right. It was too thick, too stiff, and too heavy, but I was hooked. My mind flooded with potential designs, shapes, and materials that night, keeping me up until dawn making paper models and ordering materials. It just kept rolling from there. By my peak of production I was pressing two boards per day, morning and night, working around the clock to produce a stock for a store I had hosted on Etsy. By the time college rolled around and lack of shop space on campus ended my board building career, I had made dozens of boards and learned more than I could have imagined.